Continuing this investigation of new applications for computer technology in sound studios, Clive Williamson discovers creative uses for TDM and VST Plug Ins in digital Sound Design and demonstrates how a hands-on approach to synthesizers, samplers and MIDI can help generate original atmospheres and Musical Effects for broadcast and post production. Traditionally, sound design has been achieved through a mixture of sound effects, location recordings and music: either from commercial discs; library albums; or special commission from a composer. But the latest developments in sound technology are capable of unleashing a surprising freedom for sound engineers and dubbing mixers in broadcasting and post production. Software is now available which can turn a PC or Apple computer - which many of us currently see simply as a means of editing digital audio - into a sound generator in its own right. Through software, a desktop PC can instantly be given tools for extreme sound manipulation, or be transformed into a sound sampler or synthesizer: often at the same time as carrying out its normal editing and mixing functions. In addition, advances in music hardware under the inevitable "smaller, faster, better, cheaper" design philosophy mean that it's now possible to add very powerful synthesizers to any studio to gain access to highly useful sound-sets at a very reasonable price. In the last issue of LINE UP, I showed how TDM Plug Ins for Digidesign's Pro Tools system can be used to enhance sound quality in real time when mixing and mastering hard disk recordings. In this issue I'll be looking at software geared to making even more radical changes to digital audio, and inexpensive hardware which can be used to create original sounds for use in a wide variety of productions. The concept of the 'Plug In' - a piece of software which adds extra functionality to an existing computer program - seems to be pushed further with every software manufacturer's press release! In the case of Pro Tools, we have already seen, or I should say heard, a plethora of extraordinary real time TDM modules like EQs, compressors, reverbs, pitch shifting and noise reduction. Emerging alongside these virtual versions of traditional studio tools are a new breed of Plug Ins which take advantage of the power in the Pro Tools DSP Farm cards to carry out much more radical and creative sound manipulation. A good example of this extreme processing comes from INA-GRM, a French company which has written two sets of GRM Tools for the TDM system. These are perfect for Sound Design and include: Doppler Shifting; Shuffling (micro-random splicing of audio fragments in stereo); high resonance coefficient Comb Filters; and Freezing using randomized looping. These effects are superb for manipulating audio, and frequently produce results which are at once astonishing and highly usable. Though very demanding on DSP power, they feature easy 2D creative control via a mix window and mix-down automation. One problem with perfect digital recordings, especially in radio work, is that of making them 'less clean' when necessary. Ironically, this has been addressed by Digidesign themselves with D-Fi, a handy suite of Plug Ins which helps add all sorts of grunge, distortion and even some weird Sci-Fi effects to a mix. Another Digidesign product - the Line 6 Amp Farm - is a great tube amp simulator for guitars, but is well worth checking out on other sound sources! In 1996 Steinberg, the makers of the popular music sequencing package Cubase, launched Cubase VST for the Mac. 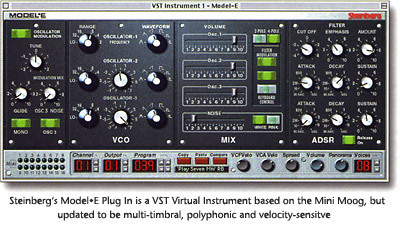 This gave us real-time audio Plug Ins by harnessing the native power of the host computer rather than relying on added Digital I/O or DSP cards. VST Plug Ins are already a significant new standard in music studios, and have lots to offer the creative Sound Designer in broadcasting too. Many VST Plug Ins work on both Mac and PC versions of Cubase, and on rival Emagic's Logic Audio Gold and Platinum. VST-based systems can lack the sheer muscle of Pro Tools TDM, but do offer an excellent low-cost alternative route to sonic experimentation. The VST round-up includes a set of four glossier-looking GRM Tools, the comprehensive Orange Vocoder (Mac only: developed by Prosoniq in Germany) and several innovative VST Instruments. The LM·4 gives a versatile 18 pad drum machine on screen which you can use to trigger your own AIFF or WAVE sound effect samples, while Model·E is a virtual analogue synthesizer based loosely on the Mini Moog. Simply add a small MIDI keyboard to your computer and you can easily experiment with original synth sounds in your mixes. 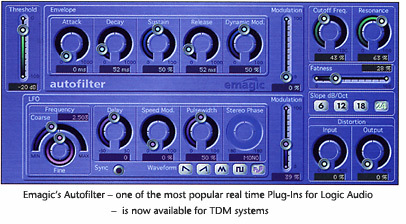 Emagic certainly haven't taken all this lying down, and have come out fighting with a fine set of real-time effects of their own, running on Mac or PC versions of Logic Audio. Besides good 'musical' EQs there is an unusual Enveloper which can reshape attack and release transients; a highly useful Phaser and a radical filter called Spectral Gate. If you're already running a hard disc recording system like Pro Tools or SADiE, it's easy to export audio to process it with these effects (or those in Cubase), then re-import it. While Logic runs fine with TDM Plug Ins, its real-time effects only work with the host computer's AV I/O or PCI audio cards such as the Korg 1212, and up until now have been incompatible with Digidesign's TDM system. Users have faced a frustrating either/or situation, but now in response to our pleas, Emagic are releasing Logic Audio 4.2 with two of their most popular Plug Ins - Autofilter and Tape Delay - specially rewritten for TDM! They've also followed Steinberg's lead in virtual instruments by launching the deliciously-styled and well-programmed ES1 Synthesizer, which sounds great through Logic's real-time effects and has a few useful ambient pads and effects for soundtrack work. Once again, adding a MIDI keyboard to your system can pay dividends and really opens the door to creativity. Especially as installing one other program can add the full functionality of a sound sampler to your computer! BitHeadz' Unity DS-1 software comes like a sonic Swiss Army Knife with a broad selection of its own sounds, but interestingly also gives access to the vast Akai sample library. 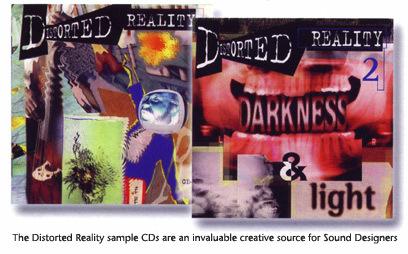 This includes the marvellous Spectrasonics discs Distorted Reality and Distorted Reality 2 - 'Darkness and Light', which are invaluable resources for any serious sound design work. They're both full of brilliant shimmering pads, industrial loops, rhythmic pulses and subtle evolving ambiences, and it's a tribute to the work of producer Eric Persing that they consistently sound the least "sampled" of any sample discs I've heard so far! Also worth checking out are his definitive vocal collection Symphony of Voices on four discs, and Liquid Grooves: cool and spacious beats which can give a programme style and a sense of motion. Incidentally, the audio versions of these discs are cheaper and can provide rich pickings either as a source of one-shot sounds, or as loops within recording systems such as Logic Audio. Speaking of looping, Infinity is a very handy Mac-based program from Antares which can help make 'perfect' loops from AIFF files for use in Digidesign's SampleCell format, or export to the Akai S3000 and some Ensoniq samplers. A new way to archive and use a personalized set of sound effects and samples is to assemble them in an EMU sampler such as the E-5000 or 6400 Ultra, then blow them into Flash ROM for fast and easy recall via MIDI, or decant the ROM into a cheaper EMU Proteus 2000 sound module. Alternatively, rather than going the hardware sampler route, you might like to consider adding an inexpensive synth module to generate all those magical copyright-free atmospheres. Korg's TR-Rack - based on the successful Trinity keyboard - has inherited many of the best qualities found in the evolving sound textures of the seminal M1 and Wavestation. Another potent synth option for post production is the Roland JV1010. This diminutive half-rack sized module contains over 1000 sounds, many of which make great building blocks for a soundtrack, but it really shows its strength when you plug in the Special FX Expansion Board. This contains about 230 waveforms (mainly drawn from Distorted Reality) which have been imaginatively reprogrammed into wonderful soundscapes, many of which animate gently into ideal backgrounds for science, nature, or dramatic productions.